Computers use these addresses to identify the sender and receiver of an Ethernet frame. For instance, imagine that Fred and Barney are on the same Ethernet, and Fred sends Barney a frame. Fred puts his own Ethernet MAC address in the Ethernet header as the source address and uses Barney's Ethernet MAC address as the destination. When Barney receives the frame, he notices that the destination address is his own address, so Barney processes the frame. If Barney receives a frame with some other device's unicast address in the destination address field, Barney simply does not process the frame. The IEEE defines the format and assignment of LAN addresses. The IEEE requires globally unique unicast MAC addresses on all LAN interface cards. (IEEE calls them MAC addresses because the MAC protocols such as IEEE 802.3 define the addressing details.) To ensure a unique MAC address, the Ethernet card manufacturers encode the MAC address onto the card, usually in a ROM chip. The first half of the address identifies the manufacturer of the card. This code, which is assigned to each manufacturer by the IEEE, is called the organizationally unique identifier (OUI). Each manufacturer assigns a MAC address with its own OUI as the first half of the address, with the second half of the address being assigned a number that this manufacturer has never used on another card. Many terms can be used to describe unicast LAN addresses. Each LAN card comes with a burned-in address (BIA) that is burned into the ROM chip on the card. BIAs sometimes are called universally administered addresses (UAAs) because the IEEE universally (well, at least worldwide) administers address assignment. Regardless of whether the BIA is used or another address is configured, many people refer to unicast addresses as either LAN addresses, Ethernet addresses, or MAC addresses. ■ Broadcast addresses—The most often used of IEEE group MAC addresses, the broadcast address, has a value of FFFF.FFFF.FFFF (hexadecimal notation). The broadcast address implies that all devices on the LAN should process the frame. ■ Multicast addresses—Multicast addresses are used to allow a subset of devices on a LAN to communicate. Some applications need to communicate with multiple other devices. By sending one frame, all the devices that care about receiving the data sent by that application can process the data, and the rest can ignore it. The IP protocol supports multicasting. 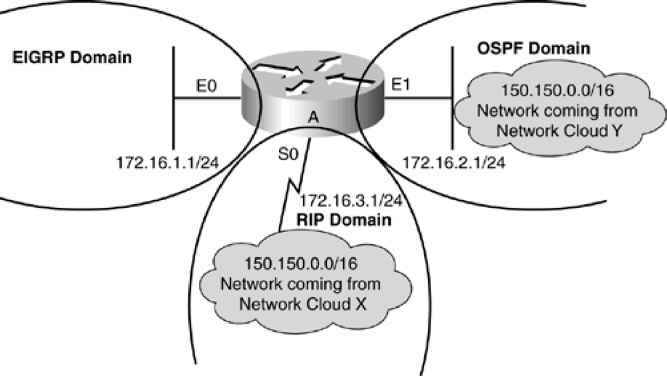 When IP multicasts over an Ethernet, the multicast MAC addresses used by IP follow this format: 0100.5exx.xxxx, where any value can be used in the last half of the addresses. Table 3-5 summarizes most of the details about MAC addresses. Media Access Control. 802.3 (Ethernet) and 802.5 (Token Ring) are the MAC sublayers of these two LAN data-link protocols. Other names often used instead of MAC address. These terms describe the 6-byte address of the LAN interface card. The 6-byte address assigned by the vendor making the card. It usually is burned into a ROM or EEPROM on the LAN card and begins with a 3-byte organizationally unique identifier (OUI) assigned by the IEEE. Fancy term for a MAC that represents a single LAN interface. An address that means "all devices that reside on this LAN right now." Not valid on Token Ring. On Ethernet, a multicast address implies some subset of all devices currently on the LAN.